Find a viable critical business issue and establish how aproject's success will be evaluated. Use a conceptual performance analysis framework to generatehypotheses for gaps in results. Establish the difference between "is" and "should" performanceand the find the cause behind it. Specify a solution set that addresses all significant factorsthat affect the gap in results. "The idea behind Serious Performance Consulting According toRummler is as simple as it is brilliant: Take a successful projectand let the reader follow the performance consultant through theproject. Geary Rummler tops it off with a play-by-play commentaryin which he explains the consultant's reasoning and offers thereader the benefit of his experience." "No smoke, no mirrors, no double-talk. This is much more than ahow-to book; it's a professional development plan for anyperformance consultant who wants to master the craft." "Before there was ′lean,′ before there was TQM, before there was knowledge management, and before there were any one–minute cures, there was Geary Rummler preaching and practicing performance technology. With Serious Performance Consulting According to Rummler, we see how important this technology can be in the right hands." 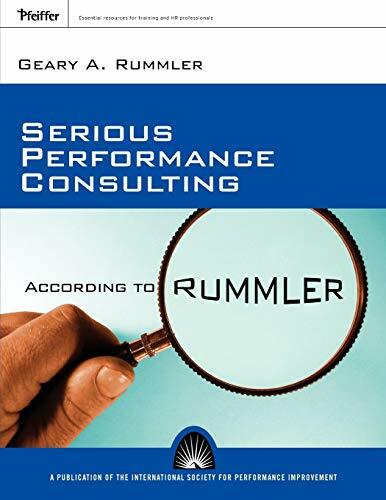 "The idea behind Serious Performance Consulting According to Rummler is as simple as it is brilliant: Take a successful project and let the reader follow the performance consultant through the project. Geary Rummler tops it off with a play–by–play commentary in which he explains the consultant′s reasoning and offers the reader the benefit of his experience." "No smoke, no mirrors, no double–talk. This is much more than a how–to book; it′s a professional development plan for any performance consultant who wants to master the craft." "Rummler shares a wealth of practical, down–to–earth lessons based on more than 35 years of experience. This is a book to be treasured by novice performance consultants and old pros alike." "The contrast Rummler draws between performance consulting ′lite′ and serious performance consulting captures the reality we face and shows the way to do it right." "This in–depth look at the real work involved in performance consulting will help you determine if you have the ′right stuff′ to be a serious performance consultant." "Based on science and practice, this book is the one to have." "Rummler articulates a model that sets the standard for both the internal and external organizational performance specialist." Dr. Geary A. Rummler is the founding Partner of the Performance Design Lab. Prior to founding the Performance Design Lab, Geary was the founding partner of The Rummler-Brache Group. Dr. Rummler was a pioneer in the application of instructional and performance technologies to organizations and brings this experience to the issue of organization effectiveness. His clients in the private sector have included the sales, service and manufacturing functions of the aircraft, automobile, steel, food, rubber, office equipment, pharmaceutical, telecommunications, chemical and petroleum industries; as well as the retail banking, and airline industries. He has also worked with such federal agencies as IRS, SSA, HUD, GAO and DOT. Dr. Rummler's research and consulting have taken him to Europe, Japan, Korea, Malaysia, China and Mexico.